Just 146km with plenty of mountains and a summit finish. It’s all live on TV including the cruel start up the Collet du Tamié. 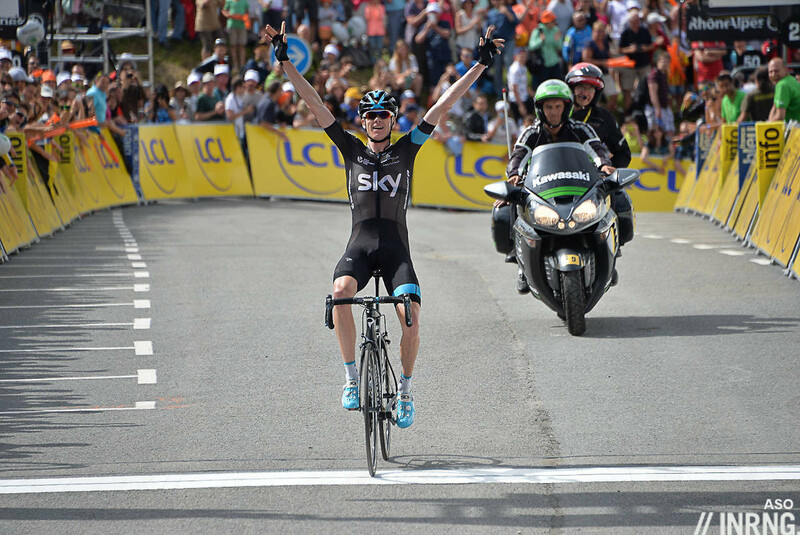 Stage 18 Wrap: Chris Froome arrived last and finished first. There were time gaps between the other GC contenders as they jostle for the podium but the top-6 overall was unchanged. Chris Froome used his TT bike and stayed in his tri-bar tuck almost all the way to put 1m21s into Bauke Mollema. The race for the podium is hotting up, there are now five riders within 68 seconds. Surprise of the day was Fabio Aru who, having spent the whole season Missing in Action, finished third. Some were wondering why Astana got to work on the previous stage and the final climb to the Emosson dam and the answer is simple: Operation Top 10 Gain. Aru is climbing his way up the GC and if Astana don’t look took too scary for Team Sky they can help the Sardinian rise up the rankings. The Route: 146km and 4,100m of vertical gain to “St. Gervais Mont Blanc”, another Tour misnomer as the finish is in Le Bettex high above St. Gervais and a 15km flight away from the flanks of Mont Blanc, the finish merely offers great views of Western Europe’s highest peak when the weather is good. Albertville will be humming to the sound of riders warming up given there’s only a brief neutral start before the uphill start via the Collet de Tamié, 7.4km at 7.6% on a rasping road that twists its way up the mountainside via several hairpins. The pass is asymmetric, a snaking, vertical climb on the way up but then a plateau with a longer, straighter and more gentle descent down the other side with few technical obstacles. They’ll speed past the intermediate sprint in Doussard to reach the opal shores of Lake Annecy and a flat approach to Talloires and start the Col de la Forclaz de Montmin. In total 10km at 7.7km with a gentler start and some flat sections along the way but this is just storing up trouble for later and the final 3km are a steep 11% to the pass. The descent has a quick drop before a flat passage then the race drops downhill via a gorge and back to the valley. Then comes a flat valley section of 11km to the industrial town of Ugine where they ride around the metal works and begin the Col de la Forclaz de Queige, 5.6km at 7.8% and with some steep, irregular sections. It’s a unusual for the Tour to use such a small road. The descent begins well, some fresh blacktop and then it goes back to normal with awkward hairpins with cracks in the road where grass grows; nothing wild but it’s a backroad rather than a highway as they drop into the Doron valley and begin a drag up to the start of the next climb. The Montée de Bisanne is 12.4km at 8.2% and a hard climb on south-facing slope which adds to the heat. It’s regular and at first snakes up past Alpine pastures where the prized Beaufort cheese comes from. It’s scenic but not stunning, a workplace rather than the stuff of postcards. The upper slopes are the steepest and the scenery fades amid the small ski resort of Bisanne 1500 before an open section up to the top of the pass. A small descent awaits as they cross over to the Les Saisies and begin a 14km descent with some high speed sections before an 8km false flat section up to Megève and then they take much of yesterday’s time trial course backwards to descend to the valley floor and 3km along the flat. The Finish: a ski station summit finish but they take a short cut. It’s new to the Tour but was used in the 2015 Critérium du Dauphiné and was where yellow jersey wearer Vincenzo Nibali cracked early and Chris Froome was paced by Wout Poels to the stage win although today’s route is slightly different. Instead of the main road via St. Gervais the race turns right up the mountain side via the hamlet of Les Amerands and there’s almost 3km at 12% and the hardest thing is the irregularity of the road, it rears up and levels out then it kicks up again, all while twisting in places too and there are ramps at 15%. Once the steep part is over they join a bigger road with some fast sections where it suits a group rather than a lone ride even if the majority of the road is uphill and hard and the road rises to the line. The Scenario: can a breakaway stay away? Yes but if 20 riders barge clear then only a few will survive the ensuing chase given this is a short and explosive stage. The start will be savage as anyone with any energy left who is not a thunder-thighed sprinter knows it’s today or tomorrow to win a stage or even just crack the top-10 so expect a fierce contest to go clear up the first climb and Team Sky to filter the moves. Anyone who goes go in the break has to be a climber to win but others will still take their chances. The Contenders: Chris Froome won here in 2015 (pictured) after Wout Poels paced him and he ditched Tejay van Garderen late on the last climb. He says he doesn’t want to win any more stages but why turn down the opportunity? Maybe he can set up a team mate, Wout Poels or another depending on their helper rotation policy. Richie Porte needs to attack to climb onto the podium, he’s sixth overall and has to pick off his rivals with more than a late surge. He can do this on the final climb where Bauke Mollema might find the early slopes severe and there’s a time bonus waiting at the finish line. Fabio Aru re-emerged yesterday with a surprise third place and if we’ve rediscovered the 2015 vintage then here is a course to suit the explosive climber with a mouth like a basking shark. Still it’s obvious he wants to move up the overall classification and if Team Sky don’t mind others will. Everyone’s buried Nairo Quintana but the cooler conditions might suit him today. When he finished the stage two days ago it look him close to 90 minutes to provide a urine sample for the anti-doping control, a sign of massive dehydration and a rookie error. It’s still hard to see him winning but he could beat the downgraded expectations. It’s not game over for Dan Martin either, he attacked on the summit finish two days ago could use his sprint. Similarly Adam Yates and Romain Bardet can jump well and a stage win is just possible if the stars align. The two breakaway picks are Rafał Majka and Ilnur Zakarin again, both are climbing very well and you tend to see the same faces in the moves in the final week. Let’s add Alexis Vuillermoz to the list too but he could be on Bardet-duty too. Weather: heavy rain before the start clearing to give sunshine and clouds with a top temperature of 24°C in the valleys. There is a strong chance of thunderstorms and hail along the way. TV: live on TV from the start to the finish. The start is at 12.55pm and the finish is forecast for 5.20pm Euro time. I think today will be interesting. There is no question Froome will win unless he crashes. Yates and Mollema can’t beat him. Porte will definitely attack to try get on the podium. In this situation why would Froome respond to an attack from Porte? He is not a threat, Froome says he isn’t worried about stage wins and Sky is strong enough to hold a gap. This leave Yates and Mollema to chase him down. Or would Froome go with Porte and if they drop Yates and Mollema would they work together to get Porte on the podium? I’m not sure that Froome is likely to do anything that could jeopardise his position. He and a team mate might follow any move by Porte, but I don’t see him leading his friend to the summit and gifting a win. Real resurgence for Froome in the discipline; until recently he has been struggling to crack the top 10 on TTs and hasn’t looked this dominant since the 2014 Dauphine. Great ride also from Porte, wonderful to see him silencing the armchair critics, and now is only 44 seconds off the podium (and would have been comfortably on it if not for the neutral service bungling). However for me the most impressive performance was Louis Meintjes. Adam Yates is (deservedly) getting lots of attention for his spell in the white jersey that he should carry to Paris, but the South African is showing why he should be considered a serious grand tour contender in the next few years. I too was impressed by Meintjes and have been all race. He’s running Yates close, for sure (but I think the jersey is safe for him) and has been there or thereabouts all race and warrented only rare mentions on coverage I’ve seen. A true dark horse. He’s done very well and would be much higher on GC were it not for losing time on the flat stages in splits and crosswinds etc. Dead right, and his Lampre team have been nowhere when it comes to protecting him. With some decent support he will be challenging for GT wins in future. Looks a very classy prospect. Aru and Astana coming good in the 3rd week of a GT again. Hmmm. Whilst the rest of us may be perplexed about the value Astana seem to see in Aru, it may just be that they know he keeps going longer whilst those around fade. Less basking shark, more Duracell bunny perhaps? Odd isn’t it that Aru and Astana only cheat for the 3rd week of a GT – they’d do much better if they cheated for the whole thing. Almost seems nonsensical for them to do this, doesn’t it? Ahem… riding well into the 3rd week doesn’t mean they’re ONLY cheating in the 3rd week… it is an indication that their magical powers of recovery means they can be closer to their actual selves in the final week… they just don’t fall off as much as the other teams! Yaddayadda. And there it is,, the whiny narrative, that was quick. Bardet was already attacking, and Chris”I invent new unwritten pee stop rules”Froome crashed while chasing. Get over it. Haha. Awesome. Yes, the whiny narrative. I’m over it. Looks like we’re getting a really solid battle for the GC placings. Let’s hope even Froome will be put into difficulty by Porte or whoever’s going the best today. New GC podium: Froome, Bardet, Quintana? It has never been the case that people wait for the yellow jersey when the race is already on. You might – might – not launch an attack if the yellow jersey has a problem, but if you’re already going, you don’t stop. That has never happened. This is particularly the case if the yellow jersey crashes through his own mistake, as opposed to – say – a puncture. People have the wrong idea about this and the myth has been perpetuated. We had this nonsense in the Giro. Not only would stopping like that mean that there is no race, but if you think about it, if the race stops for the leader then it’s only fair if it stops for the person in 2nd, 3rd, etc. too. Chapeau Bardet! But ride to the line! I would love to see how he descended – must have been incredible. I hope Dumoulin will be ok for the Olympics, but it looks bad. Your ‘evidence’ here is just as compelling as all the ‘Sky are good, therefore they are cheating’ claims. Whatever anyone else says about the racing being boring, I’ve loved it…some bits are more exciting than others but there is always something (often quite a lot) to keep me interested. Whilst yellow looks done I’m intrigued to see who races and who sits tight for the rest of the podium. Thank you inrng for adding to my enjoyment, what will I do at 6am on Monday without a TdeF preview to read. Thanks. Chris Froome has looked invincible – but two hard stages left – which has meant some boredom in one contest but there’s been lots to enjoy in and around the racing. Should be an amazing stage, especially if the weather gets challenging. What do you guys know about Nairo? Any gossip as to why he is performing so low? I heard something about an allergic reaction. There was talk of “maybe an allergy” so it seems he and the team don’t know; you can test for these things and it doesn’t sound like they’ve done it. Obviously I don’t really know what I’m talking about….but I don’t buy the allergy line. Nairo is still right up there, the only thing his missing is that little extra in his legs when it really matters – to me this feels like someone who’s form is just not quite there and hasn’t been there since the start, someone who didn’t quite get there preparation right. That allergy thing is BS Imo, it’s simple he doesn’t have the form. His prep last year was much better. Also I think Quintana hasn’t raced enough. You simply cannot recreate the training you get from racing. He had a similar approach last year with the Route du Sud too, people were saying the lack of racing kept him fresh for the third week of the Tour. But I suspect he’ll be racing the Dauphiné or Tour de Suisse next summer rather than being left to himself for May and June. One thing for me is the heat, training at altitude in the Colombian winter means cold rides and this year’s Route du Sud wasn’t hot all the time either with snow on the Tourmalet, did he have much exposure to riding in the heat prior to the Tour? It’s also interesting to consider whether that fact he did not have many race days in Europe, and particularly in France / the med, had meant he has suffered bit more from general environmental acclimatisation. Things like allergies do make sense when the pollen can be completely different in different areas (I’ve just moved from France to UK and am suffering much more with asthma). Looking at the GC rankings, it is interesting to see it in terms of “leagues” – Frome is the only one of the big 4 that is living up to expectations but really, no more than that. One would expect him to put a minute into the likes of Yates and Mollema during TTs and at least 20 seconds on each summit, so his gap there is normal. The difference is that Quintana seems to have fallen into the much bigger “best of the rest” GC contender category, which is demonstrated by the tight competition for the podium places. It was for Nico’s 10:28 am post. also, not spending time in the region you will be competing, if it is an allergy, you won’t know about it until it’s too late. If ‘The Andean Condor’ had spent more time in Europe in the run up to the race he might’ve seen the reaction and been able to get a TUE or other medication. JHutch – totally agree, it sounds like an excuse. I agree it feels like Quintana and his team (trainers, Movistar, etc.) don’t quite get his form to peak properly, whereas Team Sky and whoever their GC guy is has that process dialed down to perfection. Allergic to the yellow jersey it seems! Never yet worn it! I think it’s a classic case of a climber who has been run ragged in the opening week of cross winds and nervous stages. Although he didn’t lose any time there were several occasions when he was left to fend for himself. Movistar have come to the tour with a team of climbers and seem to be lacking a couple of classics type rider bodyguards. Movistar’s entire strategy seemed to be about containment for two weeks, then attack in the final week. It worked well, partly because of the calm/er weather in Normandy. But the windy / hot weather in southern Framce has been their undoing. Great point about the colder Colombiam winter too. Movistar have been wind-blasted and then fried. Why not just do their prep in, say, the Pyrenees and get the chance to ride in the Mistral too? Shane Stokes has got a theory – ask him. To be fair to Nairo, all of Movistar have been a step or two off the pace all race and the preparation of the whole team could be questioned. Well I dunno, they’re still leading the Team Classification as of the morning of Stage 19, which is a prize they seem to do well in (though it seems closer overall than it has in previous years). After stage 18 last year they had 36 minutes over MTN Qhubeka, and 39 over Sky. They finished 57 minutes ahead of Sky’s second place in the end after the mountain stages. That’s why they win it. Often meaning they ride to the detriment of their team leader. The fight for the podium is very interesting! Although I believe Porte and Aru are the strongest I cannot see them gaining much time as Sky will want to control the GC group until the very end of the stage. As long as Sky controls the others just follow and any major changes will be seen if someone cannot keep up with the pace. I do not believe Sky will allow attacks more that 1-2 kms out. Feels like the tour may be just a few days too long for Yates and Mollema. Porte, Bardet and Aru will be full of confidence and ambition – though that ambition will not extend beyond second place – while Yates/Mollema must be starting to doubt. A difficult situation for them on today’s tough stage though probable defensive riding from Sky will help. Meanwhile a move up for Bardet will dampen the endless accusations of boredom in France. I can’t see any doubt in Yates’s mind. He went out too quickly on the TT, a sign of his lack of experience but he certainly didn’t lack confidence on the previous day. The danger is going to be that with both Aru and Quintana fighting for the podium both Astana and Movistar should be launching attacks against on Bettex and if Sky don’t really chase them which ones do Mollema and Yates (and, for that matter, Porte) follow? I haven’t seen it reported anywhere – wasn’t there supposed to be a Bernard Hinault prize for the fastest up the Domancy climb? Who won it? Richie Porte won it, he enjoyed a podium ceremony and collects the €5000 bonus. Thanks! Not a bad return in euros / second! Best guess for Paris: Froome, Porte, Aru, Bardet, Yates, Mollema, Quintana. I see an Astana assault en route. Look out for the Astana bridging tactic today and tomorrow. I wonder if Sky will react or, as others said above, leave the rest of the GC to do it? If Sky sit it out, life will get very uncomfortable for Yates and Mollema especially; they’ll be left isolated against the attacks. For the break today. Is Kelderman totally done or have he saved himself? And why did Alaphillipe ridning max gas yesterday? I was thinking he would give it a go today. Maybe he just wait for tomorrow. Pantano seems faster on decent than the other climbers and yet he cannot follow riders uphill like Zakarin. I bet he’ll wait till tomorrow and attack. Jacky Durant on Eurosport FR had an interesting explanation regarding Alaphillipe doing the TT flat out yesterday. The French national road cycling coach has not yet decided who he will be pick to represent France for the Olympics time trial (I believe there are two spots in total). Jacky D. thought that Alaphillipe went full gas to show the FR coach that he has what it takes. Alaphilippe knows that the terrain is too difficult for him for today’s stage, as well as tomorrow’s, so not a bad strategy really. The French can’t decide who to pick for the Olympics time trial? Jerome Coppel must be tearing his hair out. Or perhaps Thibaut Pinot’s slot is now vacant, which explains Bourreau (the FR coach)’s conundrum? I would have thought Coppel’s place is pretty safe, judging from his very strong showings recently. I am curious why St.Gervais/Le Bettex paid to host a stage as it’s a terrible region for road cycling. Too few roads, too much traffic. even the steep little road at beginning of Le Bettex climb is used as a short-cut by too many cars. Beautiful region for hiking, skiing, climbing, mountain biking, etc. But not road biking. Been overly optimistic about Dutchies before in this Tour, but Mollema had better legs yesterday than on Wednesday and the cold conditions should really suit him. Don’t see him losing too much time. If Richie makes the podium will people stop saying he’s a choker not good enough to win a grand tour? With proper support and better neutral service he would have been Froome’s main challenger here. Looks like it but if he’d been top dog all the time maybe the pressure would have got to him too, once he got the deficit from the puncture he was freed of some pressure and left to get on with things. Caley Fretz on the Cycling Podcast live last night suggested something similar – that both Porte and Van Garderen struggle with the pressure of being a leader and that having ‘joint’ leadership, rather than being a weak cop-out, was clever management. Either way I’ve been impressed how magnanimous, philosophical and positive Porte has been about the time lost with the puncture and would love to see him on the podium. Saw Nairo from the roadside on the Cotentin Peninsula in the first week and he looked drawn. Was really hoping it was going to be his year. But Froome and Sky’s run in has been on the money. I seem to remember Bauka was strong in the third week, when he and LtD went top ten, although Lauren dropped down once it was clear Bauka was the best option for a result in the GC standings. It’s certainly been an interesting Tour, whether it’s vintage, not so sure. 2011 still best of this decade for me, so far. Love Allaphillipe’s head strong attitude. Don’t wanna jinx Adam, but it would be super job if he could hang on to podium pos. Like the idea White Jersey won’t be enough, even though it clearly is from the outside, looking on. Thanks for the insightful writings. Whenever I get a bit uppity with what I see on the tellybox, I tend to flick back here and calm down by re- reading one of your pieces. Majka trying to mug Jarlinson Pantano immediately springs to mind! Excellent race for the remaining podium places, what more could we really have asked for. I do feel a bit sorry for Richie Porte, what with some badly timed luck and a team that could have been more “organised” or “focussed” he may well be pressuring Froome for top spot. He always seems to nice to me and appears to lack the killer instinct for the main glory. Imagine if he had had the company Froome has had almost to the line each day. Never been a big fan of Porte but his form this year seems to have been spot on. I’m really interested to see how teams approach future Tours in light of this one, both in how they build teams and their tactics. One could probably argue Froome would still be far ahead at this point even without going off-script early on, but taking time on two innocuous stages with Panache(TM) probably didn’t hurt. Had the bonus of holding off a lot of the usual complaining about Team Sky, too (at least until week 3…). In FACT now I think about it–at least from what I’ve seen–the polemic switched from “Team Sky is boring/suspicious”, to nagging other teams about not racing aggressively in return… again, a subtle advantage to Sky. I’m a newbie so I don’t know how likely it is that this Tour will have a big effect on the next one, but at least everyone has learned (I hope) a valuable lesson about assumptions. Interesting that none of the top contenders have yet had a ‘jour sans’. Is it the route, the way Sky are controlling the race or some other reason? BMC brand ambassador van Garderen? Although not a top contender but a top 10 candidate, Kelderman has had a torrid time. Both of whom have had at least ‘semaine sans’ if not ‘boucle sans’! What do you make of Navarro’s 175th place in yesterday’s ITT? Sandbagging for today I would guess. Cofidis have looked completely devoid of ideas without Bouhanni, so need something even if only a placing on a stage. Expected more from Arnold Jeannesson. Likewise, a rest day. Navarro’s made a few tactical mistakes in the breaks, attacking too early and getting overhauled. Jeannesson’s carrying an injury which part-explains his invisibility. I’ve particularly enjoyed the absence of doping headlines at this tour, leaving the story to be about just the racing. In fact, this year has had remarkably little drama: no intra-team battles, no cups of Alpe’s Piss-in Shampoo being thrown at riders, no catastrophic tactical errors. We may need to start the rumour that Adam Yates’ is swapping with his twin brother every other stage, that might liven things up. Following on from Inrng’s roadside piece the other day, I see someone was up early to paint ‘Yates you can’ on the TT course. Has a Tour ever gone by without a French stage winner? No Spanish, Italian or French stage winner so far, this will be a definite first if the trend continues according to ITV today. The bosses of the peloton deciding no big fight is due to be held on the first climb, the break selection didn’t happen by competition but out of mere authority, that is, the leaders lining up on the front, riding slowly and “saying yes or no”. No Movistar in the break, only Lutsenko (riding pretty much on his own for a stage win) for Astana. It used to happen in the past, too (not only Lance but also Cipollini were pretty much specialist in these situations) – yet it’s a bit depressing when the whole stage is on air. Delgado on TDP pretty unhappy with the Tour’s ways, this year. Ah ah ah, Astana doesn’t agree, let’s hope someone else doesn’t obey to the orders… Trek physically blocking the road. They’re with 5 men 100 m. ahead and waiting for some more movement. Never seen that absurd a situation! Interesting observation about NQ: “… it look him close to 90 minutes to provide a urine sample for the anti-doping control, a sign of massive dehydration and a rookie error.” I could swear I saw him miss a water bottle handoff at the top of the penultimate climb that day. Teammates were still around, but nobody passed him a bottle before the bunch got up to speed on the downhill. Failure to communicate? Anybody remember this, or catch it on video? Might it have been better for Astana if they had not had the two further riders join their initial three up front? That meant that the pack was bound to chase, whereas they were letting the three go. The three taking a large-ish gap might have been much more useful for Aru than just having Astana riding at the front at a high pace. Sky might be having the gregari taking turns, but I just noticed (sorry if anyone wrote that before, I couldn’t follow very much the race and even less the web) that Sky’s got four men in the GC’s top ten. That’s pretty impressive – and doesn’t include super-Poels. Necessary premise to what I’m going to say from now on: it’s more than possible that such a peculiar situation will change before the end of the race, hence the following comparisons don’t make sense until the race will be over. What’s curious, and pretty much unique, is that the rest of people up there are *all* captains, only BMC and Movistar have got more than *one* man – they have two… – and in BMC’s case they were both captains, while in Movistar’s case we’re speaking of Valverde, who’s no pure gregario, for sure, even if it looks like he really worked well for Quintana on Wednesday. It’s pretty much an Astana Giro 2015 show, even if in that case FOUR other teams (not as few as two) had more GC men in the top 20: BMC had *three*, but also Movistar, Sky and Lotto were up there in plural numbers. It’s not totally unprecedented in the Tour, not even during the last decade, although the two only previous cases I remember were quite different: not a case of “gregari” but several riders doing, each of them, the best they could. In 2012 the team was Radioshack (Trek), with a vintage couple like Klöden and Horner along with invisibility-cloak Zubeldia (who ended up the highest in final GC) and Monfort. However, neither in that case there was such a peculiar distribution of forces in GC as this year’s TdF, since, a bit like in the 2015 Giro, as much as *four* other teams were up there with more than one rider. The Movistar structure, then called Caisse d’Epargne, could be up with four men in final GC in 2007, Valverde, Pereiro, Arroyo and Karpets. Yet again, four other teams were up in GC with two or three men. Note, however, that we’re always speaking – unlike Sky in this Tour or Astana last year in the Giro – of multiple GC winners or podiumers! Most of the other “nearly-made-it” cases had the Discovery-Radioshack as the involved team: in 2010 they came really with Horner, Leipheimer, Klöden… but Lance was just 21th. In 2007 we had Contador, Leipheimer, Popovych, but the nearest rider, Hincapie, was 23rd. If we extend our perspective to the previous decade (1996-2006), we’ve got two more situations. It’s interesting that neither involved winning teams, like T-Mobile or USPS: in those teams, the gregari apparently ended up sacrificing themselves too much. It was about two Spanish teams, the infamous Kelme in 2000 (Heras, Botero, Escartín, Otxoa) – with five other teams up in forces – while it was ONCE (Beloki, De Galdeano, Serrano, Sastre) in 2001, once again four other teams had multiple men in final GC. All in all, it looks like that it’s *not* a novelty that one or more teams do gather several top riders, even if that usually implied more GT podiumers (Sky’s got Froome and Landa, the rest of situations we saw tended to include some 3 GT podiumers, I think). What’s very different is that only captains are presently able to match them. It’s a problem of specific *concentration* of power, I’d say, and that’s why the race has been so boring. You need multiple strong riders to set any possible strategy, or any alliance. Having four riders in the top 20 isn’t unprecedented in the Tour (and it happened in last year’s Giro with Astana): what’s really unprecedented, at least in the sample I checked, that is, twenty years of Tour (plus last Giro) is that the dominant team in terms of quantity of athletes currently has to fight against a way less significant number of “strong” teams: here it’s just about Movistar and BMC, with the latter really split into *two* separate entities (until now, at least). Every strong team which had four out of 20 men in the final GC during the last 20 years, had to face at least four different other teams which had two or three rider available in high GC. Oooops! Sorry, I hope it’s ok in the rest of the post. ps – after this stage they still have 4 in top 20, and another 1 or 2 in the top 30 as well. How shameful of the contenders. They didn’t attack Froome, when he had problems. They didn’t attack each other, except Bardet. I really hope he’ll finish second in Paris. So, they let come back Froome, but they didn’t let come back Mollema, who was at a certain point less than 30 seconds behind. What’s the logic ? Then they let Froome recover in de last climb to the finish. If Aru (why did he let his team work ? ), and certainly the duo Valverde/Quintana attack one or to times in the first kms of the ascent, Froome could have had serious problems. Also Porte behaved as a teammate of Froome. I’m glad he lost some time at the end. 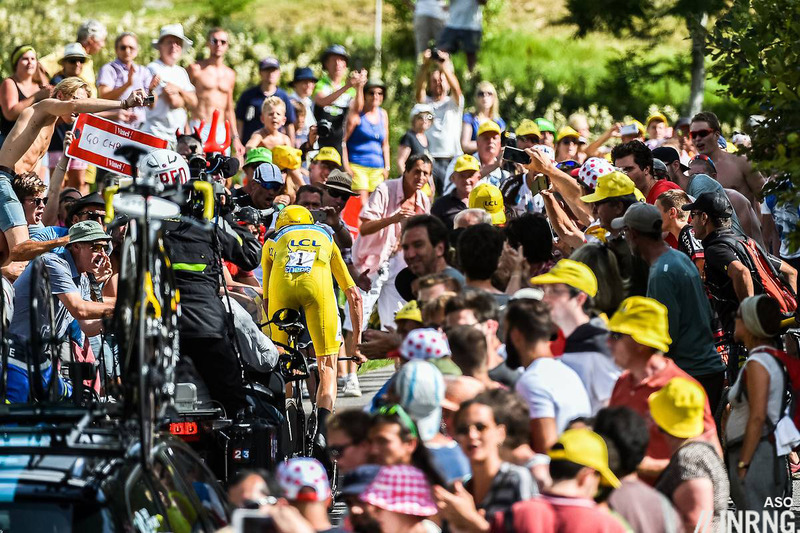 … shameful of the contenders for not attacking when Froome fell? Exactly that. Shows they are not trying to win.